A few years ago, I was out at a local event, and they were passing out mini roses in a paper pot for attending. I haven't taken the best care of them for the past few years, but every year I get beautiful flowers that I enjoy this time of year. I suspect that the roots are fully entrenched in the soil of the garden, and they grow well this year too. 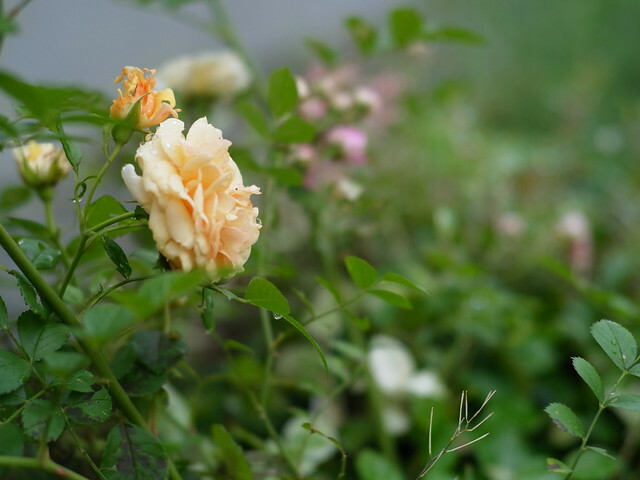 I have three roses overall, two that have small pink to white blossoms and one that is yellow and a little larger. The rose branches themselves are not all that big. So on a rainy day, I like looking at the raindrop drip over the petals and the general wet atmosphere of the scene. Taking a picture with the Sonnetar 1.1/50 at a slightly slower (but still fast enough) aperture of about F2, I can control the aberrations while achieving a pleasant "Sonnar" look. I really enjoy the outfocus of the background and especially the foreground for the Sonnetar. It almost seems like I can capture the damp moist air surrounding me. 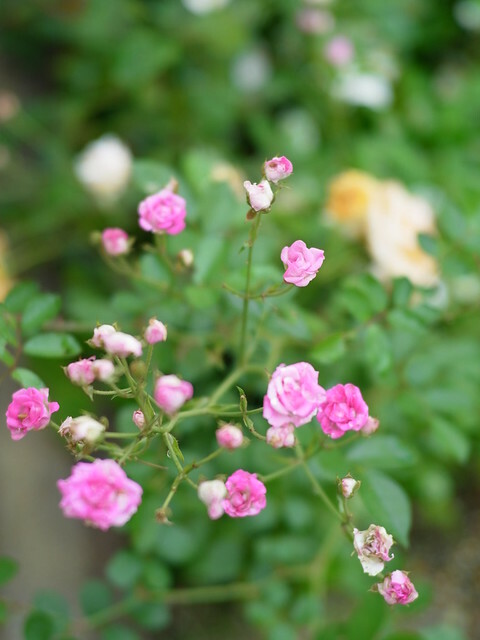 One thing I do have to say is that rose gardens looked after by professionals are beatiful and surely require a lot of work and an artistic eye.